All Rome was in great excitement this afternoon. 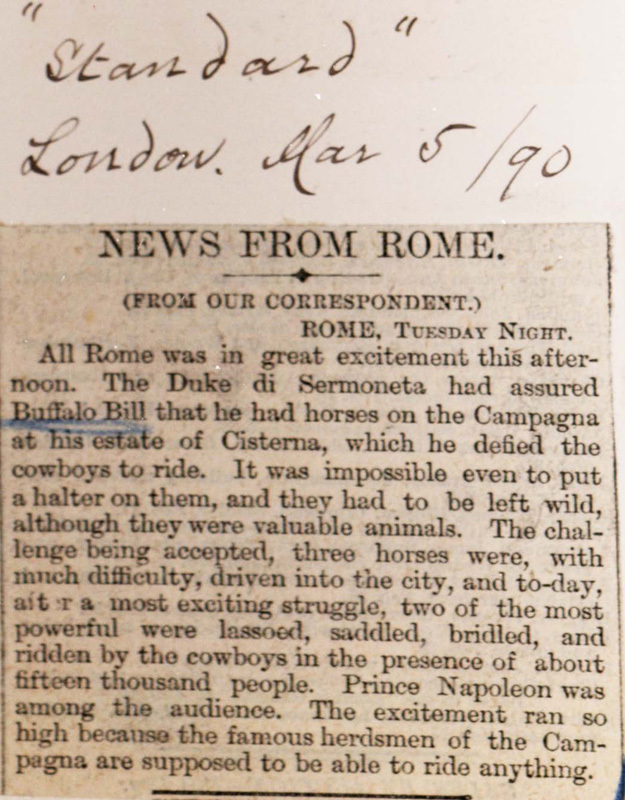 The Duke di Sermoneta had assured Buffalo Bill that he had horses on the Campagna at his estate of Cisterna, which he defied the cowboys to ride. It was impossible even to put a halter on them, and they had to be left wild, although they were valuable animals. The challenge being accepted, three horses were, with much difficulty, driven into the city, and to-day, after a most exciting struggle, two of the most powerful were lassoed, saddled, bridled, and ridden by the cowboys in the presence of about fifteen thousand people. Prince Napoleon was among the audience. 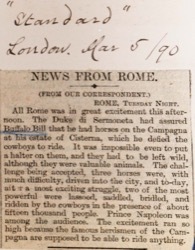 The excitement ran so high because the famous herdsmen of the Campagna are supposed to be able to ride anything.